During the many years I’ve been blogging and sharing my favorite recipes online, I’ve also been privileged to meet some great cooks and if I’m really lucky those same accomplished cooks are recipe writers and often cookbook authors. 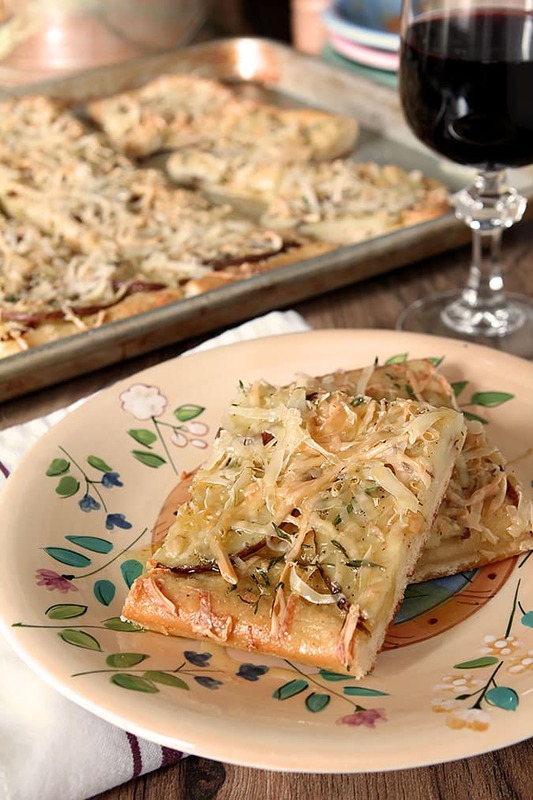 It’s such fun to see names mentioned and accolades given and think, ‘Wow…I know them!’ That couldn’t be more true of Dominica Marchetti, the author behind the beautiful cookbook ‘The Glorious Vegetables of Italy ‘ from whence this recipe for Potato Pizza with Smoked Gouda Cheese came to my attention. Domenica’s roots are in Abruzzo where her mother comes from and she continues to make frequent trips to the land of her origin; she is no Italian cook from afar, no, she brings current experiences combined with cultural favorites to her recipes and I’ve yet to make anything we haven’t loved. Even if I cheated on the dough for this pizza. Oops. 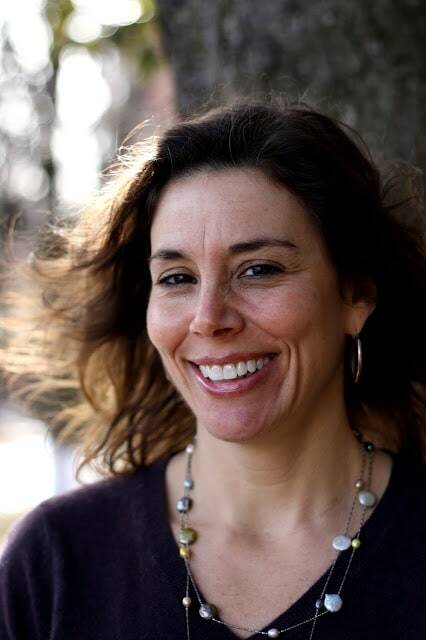 Several years ago, in another lifetime it seems, I worked with Domenica on her website ‘Domenica Cooks‘ in my capacity as the owner of a web development company. At that time I was blogging on the side and running a web business full-time. Over the course of a couple of years I made a huge transition when my love of food and cocktails and sharing them online was becoming the greater passion and my services as a web developer were becoming a job. One I no longer wanted to dedicate myself to full-time. I sold my business to another local firm and here I am…all food and cocktails, all the time! Over the course of that transition there was some letting go of that old world and embracing the new and part of that warm embrace was the opportunity to review books from the many friends I had made in the food blogging world and I count Domenica among them. I was the recipient of several amazing cookbooks and my goal was always to make something from each book and herald my friends for their talent and the skill it takes to bring that talent to the world in the form of a book. That being said; I’ve had this book for awhile; since before I moved into this house. During the course of the past couple of months, I’ve taken on the last of the necessary organization of both cookbooks and the alcohol stores that are in my home. That effort had been lacking since I moved into this house on the last day of 2013. This book and my review of it sort of got away from me. Not that anyone would blame me. I’m actually amazed myself that during some of those periods I was still standing; dealing with my daughter’s breast cancer, the death of my beloved dog Abbie and the subsequent deaths of both my father and my younger brother all in a two year span. It was a lot and while I persevered I have to admit, I wasn’t on my game, not by a long shot. No surprise right? I don’t eat meat every day and have enjoyed many a meal combining pasta with veggies so I’m excited to dive further into this cookbook and tackle some of the more elaborate recipes that are offered. Until that time, I prepared this Potato Pizza with Smoked Gouda Cheese. 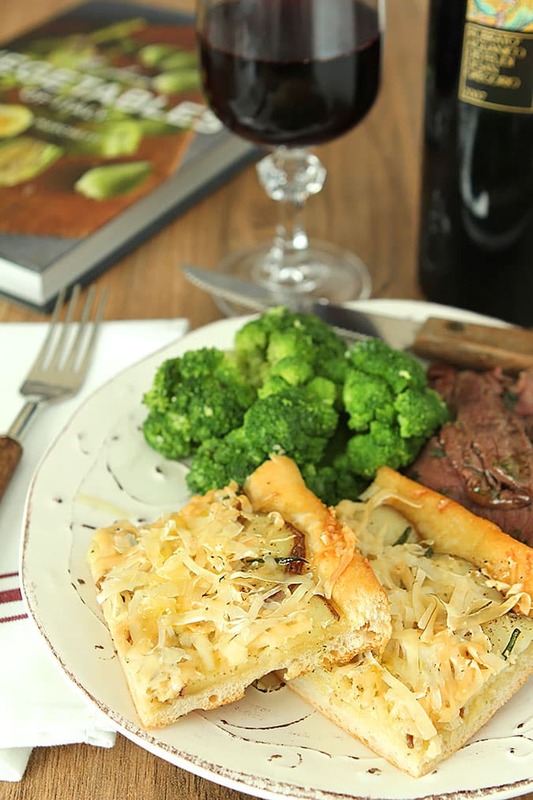 I was having company for dinner and decided it would be a terrific side dish to serve alongside buttered broccoli and my favorite beef recipe for Tagliata (Ribeye that is grilled until rare and then sliced and finished in a garlic and herb olive oil) that I published again last week. Now this is my perfect idea of Italian! It is very much like my basic favorite focaccia bread with the added bonus of thin sliced red potatoes and smoked Gouda cheese. How could that be anything but good? If my daughter Lauren were here chances are I would have had to hide it from her to insure guests would even have this on their plate; that girl loves both focaccia bread and cheesy potatoes; you can imagine how she would annihilate this pizza right? By the way? I don’t know about you but the one thing I miss most from my garden each winter are the fresh herbs. So this past fall I decided to try bringing a couple of them inside. The thyme is gone; it does not grow fast enough for as quickly as I use it but I still have some of the rosemary going strong. Super easy too. Just like outdoors it can do without a lot of water so missing a watering or two should not kill it. But I did keep it cool; hot indoor air kills everything, including me, so I keep my thermostat set in the 63-64 range. Good for the environment, good for me and now? 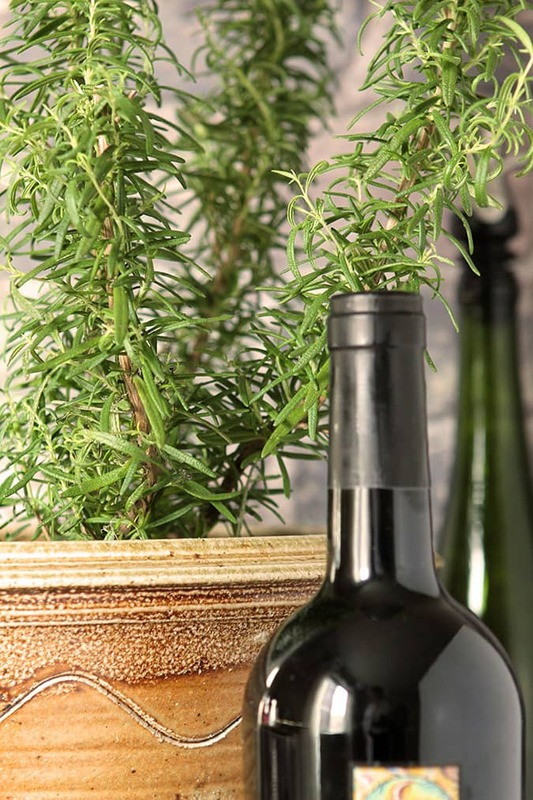 Good for rosemary; it was great to have it available fresh whenever I wanted to indulge! Dissolve the fine sea salt in a bowl of tepid water. Remove any blemishes from the potatoes but leave the skins on. Slice them thin; less than 1/8" thick. (I used my 3mm Cuisinart blade). Immerse the potatoes in the water as you cut them, keeping them from browning. Soak the potatoes for about an hour, until they lose their crispness. Drain the potatoes in a colander and then spread them out on a paper towel. Cover with another paper towel and pat dry. Generously grease a 12X17 inch baking sheet with olive oil. With oiled fingers, gently stretch and press the dough toward the rim. This wall take some time as the dough will want to spring back. Let it rest for a minute and then continue to stretch and press the dough until it reaches the rim. Brush the dough with some olive oil and then arrange the slices on top of the dough, overlapping them slightly. Leave a 1 inch border around the dough. Dribble some olive oil over the potatoes and then using your fingers, make sure all of the slices are lightly coated. Sprinkle the rosemary leaves on top of the potatoes, season the pizza with salt and pepper and scatter the cheese over the top. Bake the pizza for about 20 minutes or until the cheese is melted and the potatoes and crust are browned and crisp. Remove from the oven and let the pizza rest for 5 minutes before cutting into rectangles and serving. Can also be served at room temperature. I used purchased dough from Sprouts. They have it in the freezer cases. I buy it frozen and let it sit in the fridge overnight and then use it for pizza the next day. In lieu of having time to make my own; this is a great compromise. I've also purchased pizza dough from local pizzerias; ask yours and see if that's a possibility if you need something quick too. The combination of flavors is perfect! I’ve made a pizza with potatoes, onions, and rosemary, but not with the food of the god, cheese! This sounds outstanding. Thanks, too, for the tip on the Sprouts dough. =) Nothing wrong with that! It was so my type of pizza too. I’m over red sauce; bring me the flavors of the toppings! Oh my, this looks delicious. I’m adding it to my Easter menu. Thanks so much for the recipe. I love that…hope you enjoy it as much as we did! I know some can get it to winter outdoors but it takes a variable I guess I don’t have. Maybe it’s the years when it gets colder than zero? 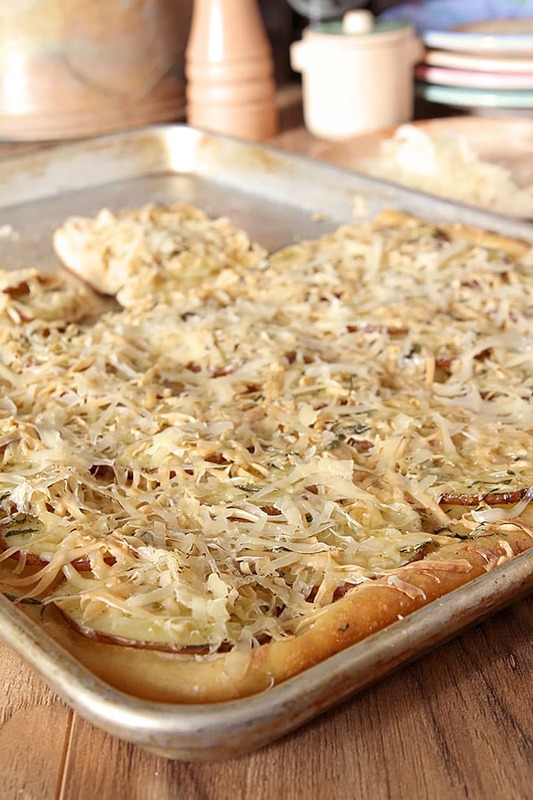 I have never met an onion I didn’t fall in love with and this pizza with its onions and smoky gouda would be perfect along with a nice glass of wine. Good choice 99!